Juan Manuel Marquez to fight Paul McCloskey? Last Saturday, Juan Manuel Marquez outpointed Serhiy Fedchenko to win the interim WBO Light Welterweight world title. According to BoxingScene Marquez told Fernando Beltran (Zanfer promotions) that he is interested in fighting a southpaw at the Cowboys Stadium in Arlington, Texas on the 14th of July. One southpaw at Light Welterweight who has been rumoured to fight Marquez is Paul McCloskey. McCloskey is scheduled to fight DeMarcus Corley on May 5th but even if McCloskey beats Corley I don't think the win would warrant a shot at Marquez's interim world title. But having said that, there aren't many other southpaws out there in the 140 pound division for Marquez to fight. The reason why Marquez wants to fight a southpaw is to prepare for a fourth fight with Manny Pacquiao. But there is no guarantee that Pacquiao beats Timothy Bradley or that McCloskey beats DeMarcus Corley so a bout between Juan Manuel Marquez and Paul McCloskey is a long way off being finalised. 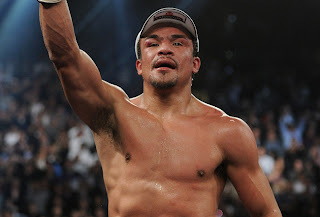 Would you be interested in seeing Juan Manuel Marquez fight Paul McCloskey?